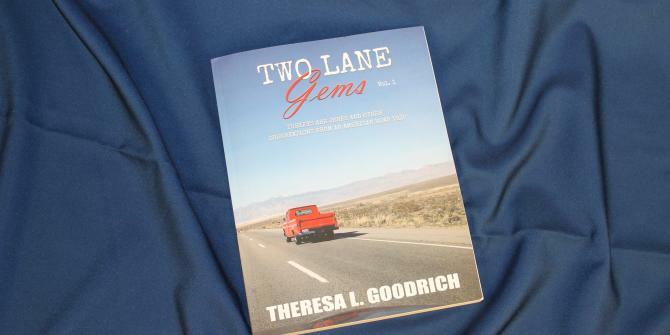 Author: Theresa Goodrich, "Two Lane Gems Vol. 1"
Intro paragraph: "On our drive through Arizona, we&apos;d felt like a soggy version of Pig-Pen, stalked by rain instead of dust clouds. Walking into Wichita Marriott, we felt like actual Pig-Pen, swirls of dirt and grime clouding around us in the perfectly pristine lobby. Because this was a classy establishment, no one remarked on our disheveled appearance. Oh, sure, we&apos;d showered that morning, but after seven hours in the car we were in definite need of refreshing. Compound that with our exploration of the outdoors for the past week and getting gussied up sounded divine."